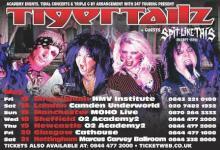 I remember Steel Panther from the days when they were a covers band called Metal Shop/Metal Skool. It was clear back then that they had a certain amount of talent, but I never expected them to achieve the success they've had since then. Changing their name to Steel Panther and writing their own songs helped, of course, as did concentrating on the comedy aspect of their music. But underneath the comedy veneer, they're actually a pretty decent band, and in some ways it's a shame they'll never be taken seriously because of their image. 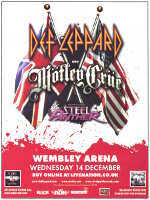 20 years ago, I was watching Mötley Crüe in this very same venue, and it was like being transported back in time. Steel Panther played a very creditable selection of music that was perfect for that era, yet amazingly, it doesn't really sound dated. This was billed as a co-headlining tour, and I wasn't sure in which order the two main bands would play. It turned out that Mötley Crüe were on first. Much as I liked Steel Panther, the gulf in quality between them and Mötley Crüe was immediately obvious from the first few seconds of opener "Wild side", which was followed by equally strong renditions of "Saints of Los Angeles" and "Live wire". Because they weren't the last band of the night, I'd expected us to miss out on Tommy's rollercoaster drum kit, but there it was in its full glory. His choice of dance music to accompany his upside down drum playing was a bit unfortunate, and with Mick Mars playing some less than stellar guitar solos, the set took a bit of a downturn in the middle. But things picked up again towards the end, and the combination of "Girls, girls, girls", "Smokin' in the boys room" and "Kickstart my heart" brought the set to a close on a high. Vince Neil seems to be getting more sloppy every time I see the band, and tonight he was at times only bothering to sing every third word or so. But somehow it didn't matter. 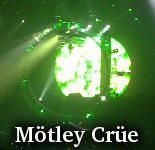 Mötley Crüe are a fantastic live band, and they put on another great show tonight. Def Leppard were going to struggle to follow a performance like that. But to be fair, they gave it a decent shot. Wisely sticking to a set dominated by material from "Hysteria", they nonetheless included songs from a decent selection of their career. 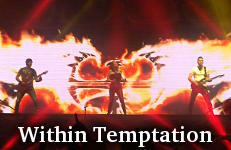 The stage show consisted of a wall of video screens which was sort of good, but like the Within Temptation show, it tended to distract from the band's performance. In some ways, they were better than I was expecting, but at the same time, I just wasn't fully getting into it, and it was becoming background music. A good performance, with "Pour some sugar on me", "Animal" and surprisingly "C'mon, c'mon" from the latest album being notable highlights, as well as the encore of "Love bites" and "Let's get rocked". But although they it's hard to pick out anywhere that they really put a foot wrong, it somehow didn't quite work for me. 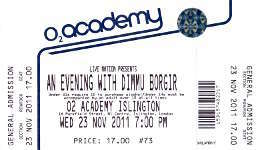 No support for this one, just Dimmu Borgir. They'd polled fans to ask which of their early albums they should perform in its entirety. The winner was fortunately "Enthrone darkness triumphant" which is the earliest of their albums that I like. They started out well, with "Mourning palace" and to a lesser extent "Spellbound", but as the album progressed, it seemed to fall a little flat. At the end of the album, the band took a break while an orchestral backing track hinted at "Born treacherous" without actually playing it. They came back out to play a set of assorted songs from their other albums. The sound was a bit muddy, with the result that my favourite Dimmu song, "Kings of the carnival creation" just didn't really work, which was disappointing. Also disappointing was the lack of clean vocals. Oh, they were there, but they were all on tape, with Shagrath lip syncing along to them. This trend was also evident on "Puritania". Although it was performed well, I couldn't help wondering how much of it was actually being performed, and how much was coming from the backing track. 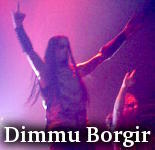 Other highlights were "Dimmu Borgir" and "Progenies of the great apocalypse". A good show, but they've been better in the past. 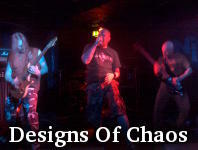 Designs Of Chaos opened up with some heavy riffing and well crafted songs. Unfortunately, they threw it all away with the vocals. Barking and growling into the mic might have its place. But that place isn't here. If there had been discernable lyrics, then maybe they'd have been able to sustain my interest. But there weren't and they didn't. 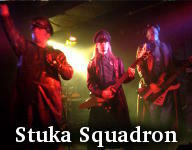 I'd seen Stuka Squadron before and had been reasonably impressed, so I knew what to expect. As before, they played traditional heavy metal with a somewhat ridiculous nazi vampire theme. Ridiculous it may be, but we need more bands like this! Great fun. Last time, I'd thought the lead guitarist was somewhat too good for the rest of the band. Sadly, there was little evidence of that tonight, and he was good but not outstanding. Hysterica had been completely misrepresented. I'd never heard of them before the show, but they'd been billed as an all female thrash band. All female they may have been, but there was no evidence of any thrash. 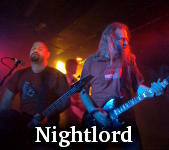 Just straight ahead traditional melodic heavy metal. The singer has quite a range. It's rare for me to want to hear more harsh vocals from a band, but this was one instance where I did. The lyrics were still intelligible and the harshness gave the songs some extra bite, which I think they needed. The songwriting was a bit simplistic, but seemed to work well enough. This was very close to being a very strong performance, but it just went off the boil in a few places which let them down. Still, they did enough I think I'll investigate their studio output. 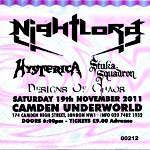 Nightlord had been doing something I wish more bands would do, namely promoting their shows. They'd been out flyering at all of the recent London shows I'd been to. Sadly, they couldn't quite deliver the goods on stage. They played a set of traditional thrash metal, and while it was quite good, it was never more than that. I don't remember them the first time around, which is probably because they never hit the big time, and it's easy to see why. There's a reasonable amount of potential there. But somehow it just doesn't hang together. The star of the band is the lead guitarist, who is really very talented. But truthfully, they could use a decent songwriter. 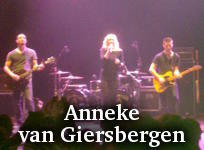 I'd never been a huge fan of The Gathering, but I knew roughly what to expect from Anneke van Giersbergen: relatively light weight pop rock. That's exactly what we got. Given that, there were a few songs that were surprisingly heavy. But it wasn't really enough to salvage the performance for me, which was mostly a bit bland. She's been doing this a long time now, and is clearly comfortable on stage. But it's not really my thing. 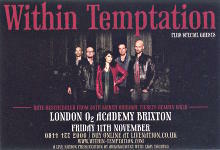 Within Temptation have grown big. I mean, even when I first saw them playing to a couple of hundred people at The Scala, I could see they were destined for bigger and better things. But it was still something of a surprise to see just how big they've become. The Scala show saw a projector and a couple of small boxes at the sides of the stage for the band to stand on, in keeping with their budget at the time. A sold out Brixton Academy makes for a larger budget, and now we have large platforms for the keyboards and drums, a huge video screen with a walkway in front of it, two smaller video screens and a full light show. Very impressive. 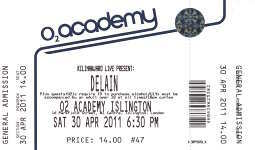 I'd had a ticket for this show for over a year. I bought it when they were first announced, but then Sharon became pregnant and the show was postponed. Because of that, Robert was staying at home looking after the newly born child, while Sharon was on tour. His replacement was a competent enough guitarist, and were you not familiar with the band, you'd probably never have noticed. The show itself was good. Sharon's voice has been better in the past, but apparently she's recovering from a cold, so I'll cut her a bit of slack. If there's a complaint, it would be that the videos were sometimes a bit too distracting. The flaming WT logo was fine, but with the full video for "Faster" playing in the background, I found myself watching it more than the band. For me, the highlights all came from the first two albums; "Mother earth", "Ice queen", "Stand my ground" and "Angels". The other complaint was that they were rotating the set list each night, and while "See who I am" is a fine song in it's own right, I'd much rather have had "Deceiver of fools" which they played in its place in Manchester. Today's openers Diary About My Nightmares weren't really what I was expecting. The music was OK and somewhat reminiscent of Dark Tranquillity. No beauty and the beast vocals here, though. This was beast and beast in full flow. The Arch Enemy style female vocals just ruined any hope I might have had of enjoying the performance. Operatika were more the sort of thing I was hoping to see at this festival. As the name implies, operatic vocals were the order of the day here, but while Slava Popova has a decent voice, she doesn't seem to have the same level of control shown by, say, Therion's Lori Lewis. Also, the real star of the band was not the vocalist, but the shredding guitarist, who seemed a strange choice for a band of that name, but put in a great performance. They ended with a cover of Dio's "We rock", which seems an odd choice to be given the operatic treatment, and didn't really work that well. The vocals lacked the punch necessary for the song. I'd never heard of Hungarian band Velvetseal before, but the soundcheck sounded great and I had high hopes for them. She had a good voice, and they were competent musicians, but they were lacking spark, and felt like they were just plodding through the set, rather than particularly putting any effort into it. The taped backing vocals broke part way through one song, which put the band off their stride. Not bad, but the soundcheck promised more, and they could do with a better songwriter. Norwegians Triosphere were up next, another band I'd never heard of before the festival. The mid-range vocals sounded very familiar, but I can't think who they remind me of. The music was heavy, with progressive leanings. The earlier material was heavier than their more current songs. They were OK, but I'd have preferred the music to be a bit more epic. System Divide offered up more beauty and the beast vocals, but the beastly vocals were particularly harsh, which didn't do them any favours. They were heavy with a brutal onslaught of noise coming from the stage. They'd been billed as being somewhat like Lacuna Coil and Arch Enemy, but I didn't really see many similarities to either. The vocals might have been somewhat reminiscent of Cristina Scabbia in places, but the music was much closer to nu-metal/mallcore. Midnattsol came across as a heavier, folkier version of Leaves' Eyes. This shouldn't really be surprising, as lead singer Carmen Espenæs is Liv Kristine's sister, and the vocal and visual similarities are evident. They were good enough, but the songs didn't seem to flow well. I'd see them again, but I wouldn't go out of my way to do so. What on earth has happened to Stream Of Passion? 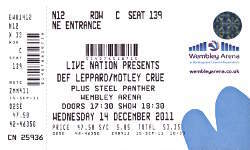 The last time I'd seen them, they were OK, but a bit lacklustre and the songs were a bit lightweight. Clearly they've improved since Arjen and Lori left. They were heavier, Marcella had a much more powerful voice than I remembered, the songs seemed better crafted. All round, they've developed into a much more interesting band. The taped vocal harmonies were intrusive and annoying, but that aside, it was a very strong performance. I hadn't heard of Draconian until a few weeks before the festival, but I quite liked what I heard. That was reflected in their live performance, which was heavy and doom-laden. Normally, that would not be a recommendation in my book, but they managed to pull it off well. The songs were well crafted and well performed, and the taped backing vocals were the only negative point for me. I'd quite liked the Visions Of Atlantis tracks that I'd heard before, but wasn't really familiar with their material. Further, they'd acquired a different singer since they recorded the tracks that I'd heard. Somewhat surprisingly, there was no bass player, so the entire set was played along to a backing track. Although they featured both male and female vocalists, there was no beauty and the beast to be seen, with clean vocals from both. She was great at times, but slightly out of tune at others. Mostly, though, the songs were just too lightweight for my tastes, and I'd have preferred something with a bit more bite. Therion were one of the main draws that persuaded me to make the trip to Belgium this year, and they didn't disappoint. Thomas Vikström wasn't able to make this show, so the male vocals were solely handled by Snowy Shaw. Although he coped admirably, they definitely could have done Thomas on stage. His daughter Linnea still doesn't look entirely at ease on stage, but she's getting there and with a bit more stage time will probably do just fine. Lori's voice was flawless, as it always seems to be. 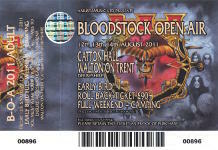 The set list was both a bit longer and a bit more aggressive than at Bloodstock, both of which were an improvement. I still don't understand why my favourite Therion song, "Typhon", always fails to make an impact when performed live, but that was once more the case here. Highlights were "Lemuria", "Clavicula nox" and "The perennial Sophia". I would have liked to have seen more material from "Gothic kabbalah" and "Sitra ahra", but that's a minor complaint about what was again a strong performance from the band. So all in all, not a bad experience for my first MFVF. With travel and accomodation, it turned into a relatively expensive weekend, so I don't think it'll become an annual trip for me. But if the lineup's right, I'd definitely consider returning. I'd been meaning to go to MFVF for years, but never quite got around to it. This year, a strong lineup tipped the balance and thus I found myself in Wieze for the weekend. Things opened on the Friday with 3 bands as a warmup for the festival proper. I'd never heard of Bare Infinity before. As has become increasingly common in recent years, they made use of a "beauty and the beast" dual vocalist setup, with clean female vocals alternating with harsh male vocals. They we OK, but really seemed to be playing the beauty and the beast angle by the numbers, sounding very generic and no different to countless other bands using the same style. The drummer appeared to be out of time occasionally, too, which didn't help. I'd seen Xandria a couple of weeks earlier in London, and hadn't been hugely impressed by their new singer. What a difference a fortnight makes! In that time, they've found some zing from somewhere, and were engaging and entertaining on stage. Manuela's voice seemed to have more variation, which was good. I don't know if the London show was just an off night or whether they were just really on form here, but if they can't repeat performances like this, I'll gladly see them again. That left everyone's favourite Tolkein metal band, Battlelore, headlining the opening night. I'd seen them twice before; once with an outstanding performance at The Underworld, and once with a decidedly average show at Islington Academy. This show was somewhere between the two, being much better than the Islington show, but not quite reaching the heights of their Underworld show. They were significantly heavier than the other two bands of the night, which I'm not sure did them many favours, but they had good stage presence and it was still a good show for me. I certainly wasn't expecting to hear a Finnish band playing in Belgium dedicate a song to stalwart of the UK metal scene, Rod Boston. Sadly, Tomi announced that it would be the last Battlelore show for the forseeable future as they were putting the band on indefinite hiatus. That's a shame, but at least they went out on a high. Personal highlights from the show were "Third immortal" and "Journey to undying lands". Openers The Mariana Hollow had sounded reasonable when I'd checked out a few samples online beforehand. They seem to have generated a bit of a buzz, and I don't imagine they'll remain unsigned for long. Lead singer Rebecca has a good voice and a decent stage presence. The songs are good, and while they're clearly a bit green when it comes to performing live, the future looks bright for them. The only downside for me was the massive overuse of a backing track. I'd missed Hærken at Bloodstock because they clashed with Therion, but I'd heard good things about them and was intrigued to see them myself. Sadly, I just don't think it worked. They played a sort of thrashy death metal, which was fine until the frontman opened his voice. I wasn't expecting opera, and harsh vocals are right for the band. But a bit of clarity would really help. 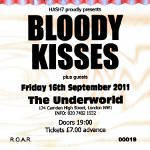 Bloody Kisses are a Type O Negative tribute band. I'd seen the band a couple of times, but since Pete Steele's death, a tribute band is now the closest you can get. I'd have to say that Bloody Kisses are close, but ultimately unsatisfying when it comes to replicating the Type O Negative live experience. The sound was just too thin, and unlike The Mariana Hollow, they could really have used a backing tape to beef it up a bit! Steele's voice was always going to be hard to replicate, but Muiris does a reasonable enough job, and Chris has nailed Kenny's vocals pretty accurately. The high points, namely "Black no. 1" and "Love you to death" were very good, but mostly the rest was just average. They hadn't planned an encore, but the crowd wanted one, so they came out and did "Cinnamon girl". Somehow they had all of the right ingredients, but the whole needed to be more than the sum of its parts, and sadly it wasn't. Not bad, but could have been better. This one got off to a good start. 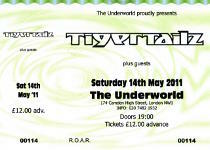 If the hearsay is accurate, the promoter was barred from the venue (which was now The Underworld, having originally been slated for Dingwalls) before the first band had hit the stage! That first band turned out to be Dead Eyes Opened, who played traditional goth. I only caught the end of the set, but what I heard sounded good enough. The Stripper Project are what remains of Children On Stun. They played what I guess I'd describe as slightly heavy, somewhat dark '80s pop, perhaps comparable to Echo & The Bunnymen. The band was about as minimal as you can get and still call it a band, with just guitars, vocals and a backing track. Dutch Order were next, with a very stripped down sort of goth sound, but not really falling under the goth banner, at least as I'd use the term. I'm struggling to find similarities, but maybe Bauhaus would be an apt comparison. Of note was a particularly hard hitting drummer. Well, I suppose the fact that they had a drummer at all made them somewhat noteworthy here. Not really my thing, though. The Last Cry were next, with a set of intense, dark traditional goth. They were quite good, but the singer was overly dramitic, which I don't think did them any favours. I'd heard some Rhombus before, but only a couple of tracks. The music was traditional goth, with both male and female vocals. It was a good performance, but after the intensity of The Last Cry, it felt a little subdued. Vendemmian are one of the stalwarts of the London goth scene, seemingly having been around forever. Traditional goth, with a guitar tone very reminiscent of The Mission. My memory's clearly hazy, but I'd remembered there being more than just the two of them. But tonight, that's all there were. 2 guitars and a backing track. Although I like several of the bands on the bill, I was primarily at this show to see Pretentious, Moi?, Tim Chandler's solo band that had been in the works for many, many years. Somewhat in contrast to his normal speaking voice, Tim has found a remarkably deep, suitably goth voice from somewhere when he sings. He's recruited Die Laughing's Rachel Iden to provide female vocals, too, which turned out to be an inspired move as she really made a big impact tonight. No drummer or bassist, and having 3 guitarists was probably a bit unnecessary. Still, a strong performance, albeit one let down slightly by a poor mix. 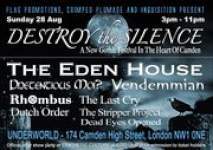 Headlining the night were The Eden House, Steve Carey's all star project after the demise of This Burning Effigy. They surprised me a bit by being more energetic on stage than their studio output would imply. But overall, it was still a bit too mellow for my tastes, and didn't really do much for me. The Hamsters were on their farewell tour before they retire, so I thought I should go and see them again while I had the chance. Unlike previous shows, they were strictly alternating the Hendrix and ZZ Top tracks throughout the set. Slim's guitar was too quiet for the first part of the show, but things improved after the mid set interval. Highlights for me were "La grange" and "Tush". Not the best I've seen them, but a decent performance nonetheless. Time for the now traditional bands playing in the Pro ET pits at the SPRC Summer Nats. The Sideshow Bobs were a competent pub blues rock band, but their set list let them down a bit. Had they played more material that the bulk of the audience were familiar with, they'd have gone down better than they did. They were good enough at what they do, but they needed to realise that the audience, while not exactly hostile, was not there as fans of them and was just looking to see a band play music they knew. The Timing Retards were Tig and Cath's hastily put together band. Again, a pub blues rock band, but playing some tracks that the audience knew a bit better. Full marks for having the bravery to get up on stage in front of an audience, but let's just say they've got a way to go before they grace the stage at Wembley. After that, The Sideshow Bobs returned for a second set, this time with some less obscure tracks. All in all, a decent night's entertainment, but perhaps not as good as previous years. I arrived just in time to catch the end of The Boss Hoss's set. Apparently they normally play covers of well known songs in a country and western and southern rock style. I didn't recognise was they were playing but it wasn't bad. Next up were Rock Sugar, a band that plays medley covers of songs from yesteryear. I'd heard a few tracks on the net beforehand, so I knew roughly what to expect. The plan was to see a few songs, and then switch to another stage to catch Ghost, a band that everyone seems to be raving about at the moment. But Rock Sugar were good enough that I stuck around and saw their entire set. Opening with "Don't stop the sandman", they put on a great show of lighthearted entertainment. That said, Jess Harnell has an outstanding great voice, and although the overall approach is lighthearted, they're serious about the music. They also win the award for best onstage quote: "Do you want to hear a new song? Well you're out of luck, all of ours are 20 years old!". A set closing "We will kickstart your rhapsody" rounded off an impressive performance. On the main stage, Skindred were playing to an apparently enthusiastic crowd, but there was way too much rap and hip hop for my tastes. The only memorable part of their set was when they got the audience to wave around items of clothing, for what they called "the Newport helicopter", which worked spectacularly well with such a large crowd. On the Jägermeister stage, Maiden United were plodding through a set of acoustic covers of Iron Maiden songs. They're all decent musicians, and Damian has a great voice. Obviously the material is very strong. But somehow it just doesn't work. The acoustic treatment is missing the point. An interesting novelty for a couple of tracks, but it just doesn't work for me for a whole set. Hollywood Undead were following the Skindred path of featuring too much rap, albeit with occasional musical interludes. The gimmicky masks weren't enough to hide the lack of musical substance. Royal Republic were hard to classify. Sort of Swedish southern rockabilly, perhaps, playing an acoustic set. But not quite. Whatever genre you choose to put them in, they put on an entertaining show, with highlights being "Underwear", "Tommy gun" and "Full steam space machine". I might be tempted to go and see them play a full electric show. Welcome Wednesday played pop rock sort of in the vein of Fall Out Boy, but without the clever lyrics. Reasonable enough, but nothing to write home about. Sons Of Icarus played southern tinged blues rock. Again, decent enough, but little to stand out from the crowd. On the main stage, Down were too sludgy, and in need of much more melody. A brief cover of "Walk" didn't help things, it being one of the worst songs Pantera recorded. Dio Disciples were a revelation. I really hadn't expected Ripper's voice to be a good fit for Dio's songs, but he proved to be a great choice. The addition of Toby Jepson for some of the songs was also a good idea. The only real downside was the criminally short set which only allowed time for two Dio songs, two Rainbow songs and one from Black Sabbath. The highlights for me were a spine tingling "Stargazer" and "Heaven and hell". An excellent show. Mr Big were OK, but came across as just a bit too lightweight. They're clearly great musicians, but you feel they peaked early by opening with "Daddy lover brother little boy", complete with electric drill, and it was mostly downhill from there. The exception was a rather good cover of Roth's "Shy boy". Paul Gilbert and Billy Sheehan are both astounding musicians, but they just seem to be lacking something here. Evile are a band that are going from strength to strength. They do the classic thrash sound better than probably anyone else right now. Good sound and an appreciative crowd helped to make a strong performance. Cheap Trick were somewhat disappointing. Sure, they were OK, but like Mr Big, they just seemed too lightweight. They lived up to their name, with numerous gimmicks throughout the show. I've never seen so many plectrums thrown into the crowd (most not reaching that far, it has to be said). Rick Nielsen's 5 necked guitar made an appearance, although he only used the top three necks. I suppose highlights would be "Surrender" and "I want you to want me", but overall, I expected more. The same could be said to a lesser degree of Twisted Sister, but only because the put on such an excellent show at Bloodstock. This one was merely good. The set seemed to start very slowly, and they lacked the energy they had at Bloodstock. However, that did change towards the end of the set, and the last four tracks, "We're not gonna take it", "I am, I'm me", "Burn in hell" and "I wanna rock" were pretty flawless. I haven't seen Alice Cooper put on a bad show yet, and this was no exception. However, it wasn't one of his best either. For a 75 minute show, it was a poor choice of setlist, including a new song, drum, bass and guitar solos and a long instrumental. The three guitarists were probably unnecessary too. The classics were good, but he's been better, and I still don't understand why he includes "Cold ethyl" or "Halo of flies" in his live shows, when he has so many better songs to his name. The set closing "School's out" had a nice touch of including snippets of Floyd's "Another brick in the wall, part 2". Finally, I moved to the main stage to watch the last few songs of System Of A Down closing the day off on the main stage. They're not my thing, so I wasn't expecting much. They could have been worse. The bad bits were terrible. The better bits were OK, but nothing more. The only vaguely enjoyable bit for me was "Toxicity". This was my first return to Donington since Monsters Of Rock twenty years earlier. The festival lineup was pretty weak for me overall, but there was enough to tempt me for a day ticket on the Saturday. Before the show, I was expecting Twisted Sister to be my band of the day, but it was Dio Disciples who took that honour, and I'll be looking out for them in the future. The last time I'd heard Spit Like This was when they handed me their demo tape at a Manowar show in the mid-'90s. It wasn't particularly good, and I didn't really think much of it. Here we are, 17 years later, with them still going. Unsurprisingly, they've improved over the intervening period, and I enjoyed their set here. It's still the same basic sleazy glam tinged rock, but they're much better at it now. The last Tigertailz show I saw was woefully underattended due to lack of promotion, and I had my concerns that this one would be the same. While it was far from sold out, there did at least seem to be a few more people here. Maybe that was just the effect of fitting the same people into a smaller venue, or maybe there genuinely were more people, but whatever the reason, it made for an improved crowd response. The band were on top form, and this was the best I've seen them since Pepsi was still alive. The set list consisted mostly of material from "Bezerk" and "Wazbones", but it was nice to see the inclusion of "Shoot to kill" from the pre-Kim era. Highlights for me were somewhat predictable: "Noize level critical", "Call of the wild" and and encore of "Love bomb baby". Sadly, they had to cut the encore short due to curfew, so we missed out on "Deuce" and "Crazy horses", but that didn't really matter. A great performance from a band that really are on top form right now. Lost In Thought were OK, playing progressive power metal, but it seemed to lack oomph, and was too bland for my tastes. Serenity, on the other hand, also played progressive power metal, but looked polished and accomplished with it. Georg Neuhauser has a great voice, and shows it off well in a live setting. In addition, they had Lisa Middelhauve, formerly of Xandria, performing guest vocals on several tracks. My only complaint is that they could have done with being a bit heavier. The same charge couldn't be levelled at headliners Delain, who were much heavier than I was expecting, and like Serenity, put on a confident, polished show. New guitarist Timo Somers performed very well in what I think was only his second show with the band. The highlight for me was a new song, tentatively titled "Get the devil out of me", which bodes very well for the next album. If there was a criticism, it was that there were perhaps a few too many slow songs in the set list. But that's a very minor complaint, and it was a good evening with strong performances from the two main bands. I'd heard the name Snake Eyes, but hadn't actually heard any of their music until tonight. They turned out to be reasonable enough power metal with decent vocals. But they were let down by their songwriting, which was just poor, with the songs lacking power. A disappointing set, with only their cover of "Breaking the law" standing out as a highlight. Inner Fire were just straight up traditional metal. It's sort of refreshing to see a band doing that these days. They're not about to set the world alight any time soon, but they were enjoyable enough. Rogue Male was a name I hadn't heard for a very long time. They had some minor success and had released a couple of albums in the mid-'80s before fading into obscurity. 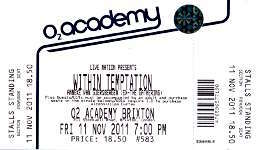 Recently reformed, albeit with a largely different lineup, they turned out to be suprisingly good. Heavier than I'd remembered, and somewhat reminiscent of Motörhead in places. I have a lot of time for Beholder. I first saw them as a covers band at Bloodstock years ago. But since then, they've started writing their own material, released a very strong debut album, "The awakening", and have some impressive live performances to their name. That said, this wasn't one of their better performances. Although there was no lack of effort from the band, they suffered with a poor mix. However, "Heretic", "March of the damned" and a cover of "Holy diver" were all worthy enough to stand out in my memory. I arrived too late to see either of the supports, but I wasn't expacting to like them anyway, so I don't think I missed much. 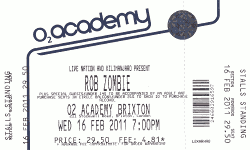 I'm not the world's biggest Rob Zombie fan, but I don't dislike him, and a friend didn't want to go on her own, so I'd tagged along. He'd promised to bring his full US stage show over, and sure enough, the stage had 4 huge video screens, pyro was plentiful, and all manner of Eddie-like creature strolled around the stage. But ultimately, no amount of showmanship can hide the fact that the music just wasn't to my tastes. The songs kept threatening to break into Rammstein-like stomp, but never quite made it, and the vocal lines just weren't varied enough to make the songs interesting. Even on the better received tracks like "Thunder kisses 1965" and "Dragula", it all just seemed a bit flat. He put in plenty of effort, but sadly it was a disappointing evening for me.